As stated yesterday Easing Into Eorzea is my attempt to explain some of the unique concepts in Final Fantasy XIV from the perspective of a traditional western MMO gamer. There are a number of concepts that come up in Final Fantasy XIV that are not immediately relatable based on past experience. It is my hope that I can act as a bridge to help players get adjusted to these changes. In yesterdays post I went over the various base classes of the game, and today I will be going over the various leveling options. There is no one correct path to 50 on each class but there are a few things you should definitely be aware of. When you first start a character you will be plunked down in the middle of one of the capitol cities depending on which class you chose. The amount of quests presented before you will feel extremely staggering. The first misconception is that you have to do all of the quests. In fact the game is not intending you to do them all, at least not on your first class. Most quests are not repeatable and are not limited to your specific class combination. The ones you find in the starter city are generally designed to teach you the layout of that city and where to find important amenities. This can end up being an extremely frustrating experience as you spend the next couple of hours running around town delivering parcels. Generally speaking I rush out into the country side and get my first few levels by killing stuff outside the gates, but I will get into that as we go forward. 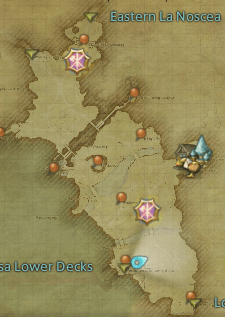 The first and most important leveling option you have is your Main Scenario quest line. This is essentially the story of your character and how it relates to the game world around you. If you have played a game like Star Wars the Old Republic, this will make sense to you as you have one overarching narrative that guides you through the game. 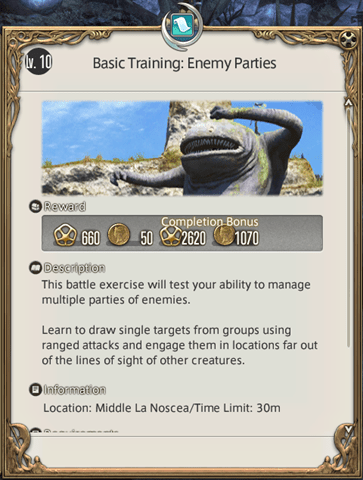 The main scenario quests appear with a golden icon in the shape of the comet Dalmund that served to destroy the world between FFXIV 1.0 and 2.0. You will start the game with one of these quests in your log, and each time you turn one in, the quest will continue from either the same NPC or one standing near by. If you ever lose the quest chain, return to the last place you turned in and there should be another NPC featuring the same comet icon to continue it. There may be times where you do not meet the requirements for the next step in the chain. If this is the case the icon will appear Red and when you talk to the NPC it should give you an indication of what you need to do to continue the storyline. Generally speaking these are level based hurdles and simply leveling up will take you to the next quest in the sequence. The main storyline is extremely important in that the game gates a large amount of the content based on your progress. It will unlock your access to a mount, access to grand companies, and access to most of the dungeons in the game. As such it is extremely important that you stay up to date on the story quests. The positive is that story quests are generally worth a good chunk of experience. One of the awesome things about Final Fantasy XIV is that unlike many other games the story keeps evolving. Each major patch that gets released adds new quests to the main scenario, taking you past the resolution of the initial conflict. This gives the world a very “living” feel as you continue to get to learn more information about the characters involved in it. Additionally the game uses these later quests to introduce you to the casual raid content. Generally speaking when talking to a friend just starting the game I suggest that they make completion of the story content their number one priority. Similar to the main scenario quests, there will be quests that you get from your class trainers. The quests appear at level 1 and then every level divisible by 5. These will often introduce you to concepts for playing your class as well as provide you some decent gear as you level up, often offering a new class weapon each time. These will always start in your class guild but can easily be identified by the icon which represents your current class icon. When you reach level 30, the quests stop in your class guild, but will continue on with what ultimately ends up being your Job trainer. At this point the quests become extremely important, because each Job quest grants you a new ability. These abilities are often needed to complete the content. For example at level 35 the White Mage quest grants you the Regen ability, which is a heal over time and greatly smooths out some of the issues that White Mages have with healing on the go. While there are a few Job abilities that are “nice to have”, the vast majority are massive quality of life improvements. As such I suggest you always do Class and Job quests as soon as you can, to make sure you are caught up in the chain. As I mentioned before, this game will seemingly flood you with quests when you start. The ones in the starter cities tend to be mostly “fedex” style quests, whereas once you move into the countryside they will start offering you more traditional hunting style quests. In the early days of the game, players avoided doing Side Quests like the plague, because they feared they might need the experience later to level additional classes. This honestly was a problem as there were very few ways to get good progress without the much needed quests. The game however has added in a bunch of options and rebalanced the ones that we currently have to smooth out the leveling path considerably. As such I think Side Quests are something you should make your own choice about. They often provide much needed gear, and sometimes interesting things like pets but as the name would apply they are entirely optional content. They are marked by the traditional Q icon over the NPCs heads and will involve all sorts of things in the near vicinity. I personally try and complete all of the quests I come across, because later patches will introduce new quests in areas. By completing the quests I can more easily see if new content has been added. Doing ALL of the quests will likely cause you to out level your class and main scenario quests, but it really is a matter of personal preference. FATEs or Full Active Time Events are little events that pop up in the zones you will be leveling in. They are marked on the map to the side with the pink and gold icons. For those who have played Rift, these function much like Rifts spawning do. A series of mobs that will be marked with a pink icon over their head will appear and as you ride into the area of the fate some objectives will appear in the quest list. If you are too high for a given FATE there will be an option in the quest list to synchronize your level down to the maximum for that given fate. 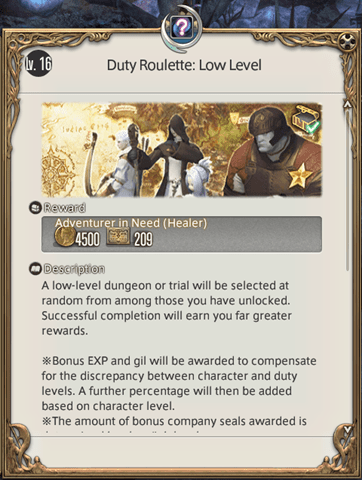 Completing the event will reward a good deal of experience relative to your level, some much needed Gil and once you have joined a Grand Company some of their currency in the form of Grand Company seals. You are graded in the FATE based on participation and there are Bronze, Silver and Gold ranks. Some FATEs might give you special items, usually cosmetic pets if you get gold rank contribution. However it is generally best to shoot for gold regardless as it will reward more experience and gil in any case. There are a number of ways to “cheese” a fate and that could be a discussion in its own right. The basic theory is you are rewarded based on the threat that you generate. Healing and Tank abilities generate lots of threat, so they will almost always have high contribution. For DPS they are in a bit of a pickle since generally speaking their job is to NOT generate threat. There are a number of super threat happy abilities like Blood for Blood that you can hit during the fate to try and cause as much damage as possible. Since launch however they have relaxed the guidelines for contribution a bit more to make it far easier for someone to show up a bit late and still get gold rank. FATEs are almost always worth your time, and in the past a completely valid method of leveling a class was to do nothing but them. Once you reach the first major city outside of your starter city there should be a vendor there called a Levemete. 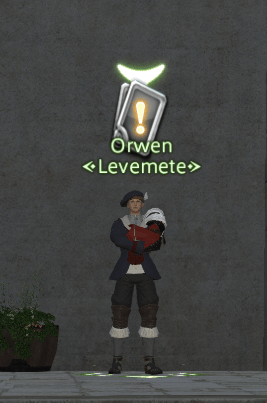 They give you a special kind of repeatable quest called a Leve or Levequest. The quests are timed and once started involve completely various objectives. You are rewarded based on how fast you can complete the quest, and this is often a decent way to get gear either as a reward for the quest or from treasure coffers that can randomly spawn out in the field while completing them. It feels like they have gotten a bit stingy with the coffers in later patches, but at one point this was a really good source of “pink” gear which in their confusing itemization coloring system is a step above white gear but below green. The catch is you only have so many leves per day, but these accumulate over time until you have 100 “leve allowances”. You will accumulate 3 leve allowances every 12 hours. These are not the absolute most ideal way to level, however if you are close to a level and just need a bit more experience they are not a horrible way to get it. Recently I leveled Arcanist to 15 doing pretty much nothing but these, and while it was a bit proding it worked out just fine in the end. They are also a pretty good source of Ventures… which I will get in much later in these guides, but I am just mentioning it now so you will have it in the back of your head. When you reach level 10 the Duty system opens up for you, and you can access it by hitting the default hotkey which is U. Duties allow you to queue for content and the first type that becomes available are Guildhests. These are somewhat confusing beasts, but the closet simulacrum to them is the World of Warcraft Scenario system. They are like a dungeon, but not really a dungeon at the same time either. Generally speaking they focus on teaching players a specific grouping skill that they will need later. They are not really chain grinding, but they are definitely worth completing the first time as there is a massive experience bonus. From level 10 onwards you will get two new guildhests you can complete every 5 levels. If you do pay attention to the objective they end up explaining concepts that you will be guaranteed to see once you start running dungeons. The frustration is that at least for the first couple, until players have gotten the message… folks will immediately try and dps down everything regardless of what the objective is telling them. This often leads to the hest taking more than twice as long as is actually needed. Similarly while it requires a tank and a healer… I have too often found that neither of these roles actually does what they are intended to be doing in hests. As a healer I usually end up tanking everything, as the tank is either unable to hold aggro or is willfully avoiding doing so. That said… frustrations aside they are well worth the initial experience boost. At level 16 you unlock the Duty Roulette system. While at 15 you can queue for Sastasha the first of the dungeons, the Duty Roulette system seems to be a bit more charming. The idea is it works the same as the various other dungeon finder tools, but in my experience players in FFXIV are actually welcoming to new players. The reason behind this is that they have tied some fairly significant rewards to the player commendation system. Each player gets exactly one commendation that they can award at the end of the dungeon run. You are prohibited from giving these rewards to members of your own Free Company (guild). As such players tend to be on their best behavior in the hopes of doing something, either through their actions or just by being friendly… to earn a player commendation. The joke is that only the healers and tanks get them, but I racked up enough to get my first few rewards while doing dragoon dps. Duty Roulette is a really enjoyable if aptly named tool. You can have the smoothest run you have ever experienced, or you can have an exceedingly rough one. When leveling I am generally always queuing for a dungeon. As DPS I tend to queue directly for the highest level one I can run, and as a Healer or Tank I just do random chance, as there are almost no options that are not worth my time. The problem you run into as a DPS is when you get one of the primal encounters. I will go into what those are later, but essentially it is a single boss fight that is worth next to no experience and is part of the main storyline. There was an evening where I waded through 3 30 minute long queues only to end up with a primal each time. Since I was queuing for experience gain, this mean I basically had wasted my time. As such when working on DPS I find it best to simply queue for whatever the highest level dungeon is you are capable of completing. I am going to close this post off for now, but this covers some of the most basic ways of leveling. As you get higher level more options unlock, and I will cover those in a subsequent post. At this point I would like to open the floor for discussion. Are there certain points of Final Fantasy XIV that you find confusing? I am looking for more direction in what areas you would like to see me cover. Ultimately I am trying to take the concepts and explain them as plainly as I can, and I have already gotten some ideas from guild members. I plan on doing a few of these posts a week, at least until I run out of topics to post about. I am trying to get some of the basic information out there before I start delving into more nuanced discussions. You might watch Rae’s blog, as I know she plans on doing some posts about the various healing styles as well.